Mullins Company is a specialty contractor installing spray foam insulation, fiberglass insulation, acoustical ceilings, and acoustical wall panels in both the commercial and residential sectors. In 1949, founder D.A. Mullins laid the foundation for Mullins Company when he started an insulation and home improvement business. He added a new layer to the company 10 years later when he expanded into the acoustical ceiling business. Over the years, D.A. partnered with his son, Chris Mullins, and the collaboration evolved into the successful East Tennessee insulation and ceiling business that continues today as Chris Mullins Company, LLC. Mullins Company combines layers of history and expertise with layers of good service and good people to build a reputation you can count on. We aim to exceed every customer’s expectations as we set the standard in insulation and acoustical services. Our ability to provide the best to our customers hinges on the company that we keep. We’ve built relationships with reliable, top-notch manufacturers that we trust to give you peace of mind for years to come. With quality manufacturers like Armstrong, Owens Corning, and Icynene, the strength in the products we install is unrivaled. The success of our business is due in large part to the experience, professionalism and dedication of our employees. 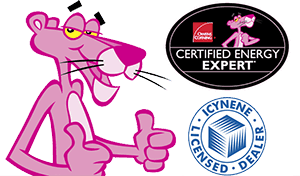 Our trained insulation installers are certified through the Owens Corning Certified Energy Expert (CEE) Program. Mullins Company has an average of 40 full-time employees serving the Tri-Cities and surrounding region, and is licensed and insured to serve Tennessee, Virginia, North Carolina, and Kentucky. We recognize the need for and safe and a healthy work environment by maintaining a drug-free workplace policy. Mullins Company is a member of The Associated General Contractors of America, National Home Builders Association, Insulate America and the Kingsport Chamber of Commerce.